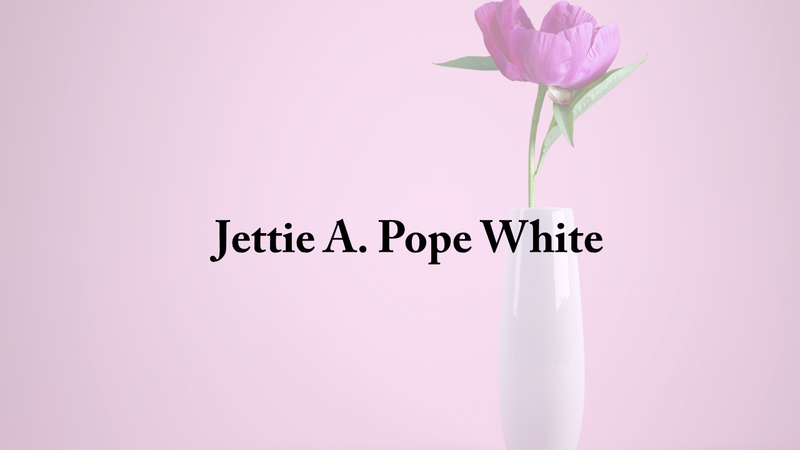 Jettie A. Pope White, 88, passed away peacefully at The Hanceville Nursing & Rehab Center on Feb. 20, 2019, after an extended illness. Jettie was born on April 15, 1930, in Leon, Kentucky, to Ellis and Pearlie Jane (McDowell) Pope. Jettie was one of 12 children and the last to be born behind a twin sister. At an early age, so the story is told, Jettie and her twin sister, Nettie, moved to Ohio and lived with an older sister who got them both jobs working in a factory, Sun Rubber, that manufactured dolls among other things. Sun Rubber is where Jettie met the love of her life which later became her husband of 61 years. In 1964 Jettie, along with her husband and four children, moved to Alabama where she has spent the rest of her life with her family. Jettie was preceded in death by her parents; siblings; husband, Roland E. White; and son-in-law, Charles M. Overstreet. Jettie was survived by daughters, Brenda Overstreet and Sherri (Byron) Hale; sons, Michael (Belinda) White and John (Tamatha Helms) White; grandchildren, David (Angie) Overstreet, Ashley (Chris) King, and John (Megan) Henry; great-grandchildren, Mackenzie (Caleb) Bonds, Landyn and Alyssa Henry, and Grayson and Isabella King; and great-great-grandchildren, Kennedi and Luke Bonds. Jettie had a love for life, her husband, her family and her flowers. Her rewards in life came from pleasing and putting others before herself, caring for others, and helping to care for her babies. She loved them babies. The family wishes to thank all of you that had a part in the care of Mom over the past few years. We will forever be grateful. Special thanks to everyone at Hanceville Nursing & Rehab and SouthernCare Hospice. You all hold special places in our hearts. No visitation is scheduled and burial will be at Valley Springs Cemetery. Cullman Heritage Funeral Home is in charge of the burial and arrangements.